Garden Grove, pop. 171,000, is 20 miles southeast of Los Angeles. Some of Garden Grove's tickets can be ignored. If your "ticket" does not have the Superior Court's name and address on it, it is what I call a "Snitch Ticket." For more details, see the Fake Ticket section on the Your Ticket page. Zev "termed out," and in the Nov. 2014 election Sheila Kuehl won the race to succeed him, by a narrow margin. Now she is an LA County Supervisor and has a seat on the MTA/Metro board where she will be a vote to continue and expand Metro's huge (101 cameras, so far) red light camera system. 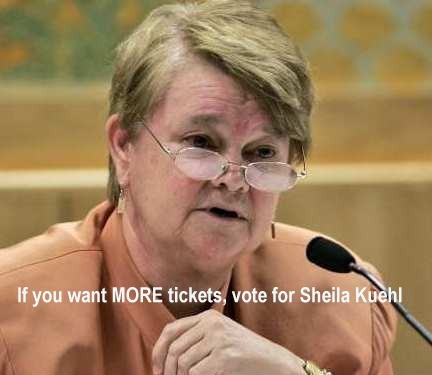 Kuehl may be up for re-election in Nov. 2022. Do you live in Orange County, in or near Anaheim, Corona del Mar, Costa Mesa, El Toro, Huntington Beach, Irvine, Laguna, Lake Forest, Newport Beach, Orange, Tustin, or Villa Park? 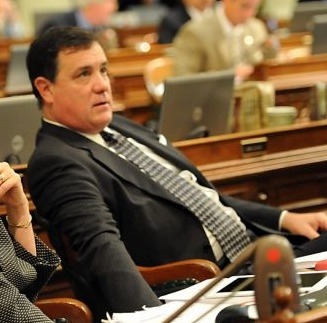 Was Donald Wagner your State assemblymember? In 2014 Wagner was the sponsor of Assembly Bill 2487 which would have taken away your right to a Trial de Novo. In early 2015, while he still was in the Assembly, Wagner ran to jump over to the State Senate, but lost to John Moorlach. Early the next year he started another Senate run against fellow Republican Moorlach, but backed down after encountering heavy criticism from their Party followed by the Party's endorsement of his opponent. Later in 2016, when he was just months away from being termed-out of the Assembly, he ran for mayor of the City of Irvine, and won. It's predictable that Wagner will run for higher office again. Please don't reward him with your vote. Be sure to read the "Countywide Information" for OC, which is Docs Set # 6 on the Santa Ana Documents page. This table made by highwayrobbery.net, using official monthly reports of citations actually issued. [ ] indicates a footnote. Totals are as provided by the City. Annual totals, or annual projections, are by highwayrobbery.net,and are based on just the data posted in the table. Un-used columns are to allow for later expansion of City's system. Jan. 2004 counts are incomplete. Enforcement on right and left turns has been indicated, when known. However, the absence of a "Rt" or "Left" indication does not necessarily mean that there is no enforcement on turns at that intersection. The compass direction of enforcement, and/or the movement ("thru," "right," "left") noted here may be incorrect. Except where noted otherwise, the figures given in the table are for the single calendar month indicated. 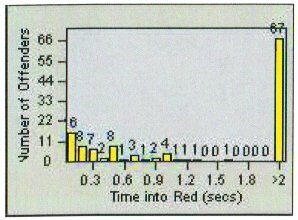 Figures in red type and not enclosed in parentheses (or, if you are looking at this table in black and white, the upper figure when there are two or more rows of figures in a cell) are what RedFlex calls Total Processed Incidents or Total Violations, and represent Total Detections (all incidents flashed by the camera) minus Nonprosecutable incidents. Any figures in (red) type enclosed in parentheses are Total Detections. and come from the official report entitled RTS Management Report (example) which, beginning in 2013, highwayrobbery.net will be requesting from all cities. The figures in black type are what the city calls Notices Printed, and represent the sum of genuine citations issued (those filed with the court) plus any Nominations mailed (not filed with the court, a.k.a. Snitch Tickets). Due to time limitations, complete figures have been posted only for selected months or cameras. If there is sufficient public interest, the remaining months or cameras will be posted. Not in operation due to construction. All data has been received (see links, above) but only a portion has been posted, due to time limitations. Data for this month was requested in:. there is no difference between it and the one at the top of the table. The official report for this month was generated less than ten days after the end of the month. As a result, many violations were still "in progress" and the eventual number of "approved violations" would be expected to be greater than the number shown in the official report. Before being posted in the table above, the figures given in the official monthly report were adjusted by assuming that the "in progress" violations would be approved in the same proportion that violations were approved during the previous calendar year. The BRWE cameras were not listed in the official reports for these months but still may have been in operation. The reports for these months did not include data for MATR-01 as it may have been inactive at the time the reports were run. From the annual reports required, beginning with 2013, by CVC 21455.5(i). They become available by the Fall of the following year. To see all the timing charts and speed surveys I have received, go to Timing Charts - Garden Grove Docs. Until late Summer 2006, the warning signs at some Garden Grove intersections were much smaller than the required warning signs (see Defect # 4), didn't carry the required symbol or language, or were placed on the far side of the intersection instead of in advance. Now the City has replaced them with the proper signs. In Feb. 2012 the City agreed to a six-month extension, to Aug. 2012. In July 2012 the City approved (staff report and minutes) a three-year extension plus two automatic one-year extensions (unless, 60 days in advance of the expiration dates the City notifies RedFlex of its intent not to extend). Contract extensions should never be automatic - this is not a contract for cable TV! In 2015 the the deadline to stop the first of the two automatic extensions was looming, so on June 9 the city council discussed (staff report) the continuation of the camera program. The city manager described the purpose of the discussion as follows. "The Mayor has expressed an interest in taking an in-depth look at the effectiveness of the red light camera program including but not limited to cost, accident reduction, community impact, liability considerations, etc. The intent behind the request is to schedule this for a future City Council meeting or Study Session so that all of the information related to this program can be made available to the City Council and the public. Consequently, we will not be generating reports for Tuesday's meeting but discussing the topic generally with the intent of setting a date & time specific in the future..."
On June 23 a Voice of OC article (archived copy) headlined "Garden Grove Might Nix Red Light Cameras" said that the council's action had been to request a review of the program - at a later date. They did not vote to send a 60-day notice to RedFlex, so missed the deadline to stop the first of the two one-year extensions from occurring, and lost the opportunity to bargain for a better price. The City would have to continue to pay $2279 per camera per month - way too much (see invoices) - until June 2016. Example of lower prices: In March 2014 the City of Elk Grove, California approved a new contract which specified the following schedule of rents for their five RedFlex cameras. The review occurred at the Aug. 25, 2015 council meeting. Staff Report By then, all of Garden Grove's cameras were ten years old or more ( installation dates ). At the meeting the council agreed - the deadline to object had passed - to extend the program for a year and to continue to pay $2279 per month per camera (52% too much, compared to the Elk Grove price schedule), an extra $130,872 extra during the year. To cover that extra rent, Garden Grove will need to issue an extra 1309 tickets during the year (assuming that the City receives an average of $100 for each ticket issued). The council expressed concern about questions raised in two letters from the public (SaferStreetsLA Report highwayrobbery.net email), so ordered staff to do a further study of accident rates. The accident study was approved by a 3 - 2 vote. It appears that in June 2016 the second (and last) one-year extension occurred automatically, allowing the program to continue until Aug. 2017. Early 2017 invoices showed that the City continues to pay $2279 per camera. At the July 25, 2017 council meeting they approved 5 - 0 (O'Neill and Bui absent) a four year extension of the program. Early 2018 invoices showed that the City was paying $2200 per camera, a 3% reduction. This list of contracts and amendments was up-to-date as of June 2018. The City provided bar graphs of Late Times, etcetera, for all fourteen cameras. These graphs track violations recorded, not tickets issued. Where there is a large number of long Late Time violations in a curb lane, it is believed to indicate heavy ticketing on right turns. The picture above is an example from another city. Bar graphs are available for more than fifty other cities - see the list in the expanded version of Defect # 9. I was not able to find red light camera program info at the police department's website. 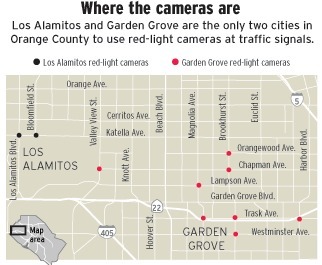 The 2004 - 2005 OC Grand Jury did a report on red light cameras. That report, and the cities' (required) responses, are on the Grand Jury's reports page. If you wish to read grand jury reports about the red light cameras in other cities, go to the Grand Jury entry on the Site Index. There may be some more Garden Grove information posted in the next few weeks. Mark your calendar to remind you to come back here and look!